The taste and tradition of Seaport Coffee is so popular with Texans and so well-respected that the Texas Legislature submitted a bill to make Seaport the Official Coffee of Texas. 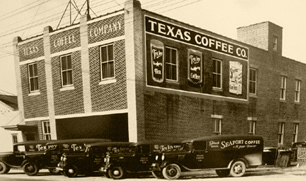 Texas Coffee Company began in Beaumont, Texas in 1921 when Charles J. Fertitta, Sr. recognized the demand for a good quality coffee with a distinctive aroma and flavor. Mr. Fertitta began with an investment of $1800 and a Ford Model-T truck, a few pounds of coffee and a one room “shotgun” style shack in back of the Crescent Market on Magnolia Street in downtown Beaumont. In 1926, Mr. Fertitta recapitalized the company by forming a partnership with R. C. Maceo and Joseph S. Serio. They moved Texas Coffee Company to a larger, more modernized facility that was better equipped to handle the growing customer base. With this new partnership, Mr. Maceo was plant manager while Mr. Fer titta and Mr. Serio delivered their product in the Beaumont and Pt. Arthur territories. In 1968, Texas Coffee Company became the first coffee company in the United States to begin packaging coffee in vacuum-packed foil bags. This technology is now the industry standard. 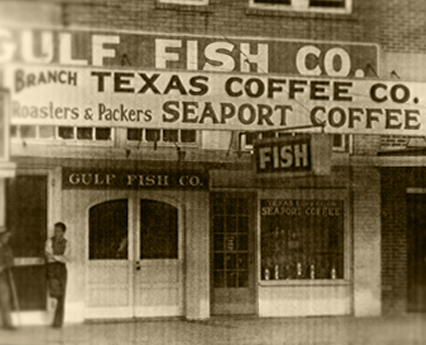 The site on Martin Luther King Parkway (previously named Port Arthur Road) is still the home of Texas Coffee Company. Its corporate offices are housed there, as well as the manufacturing facilities. Manufacturing equipment has been updated but a certain nostalgia remains in the old hardwood floors and exposed steel beam supports, not to mention the exotic aroma of fresh roasted coffee beans. Texas Coffee Company is the manufacturer and distributor of Seaport coffee and Texas Coffee. Each brand is distinctly different and appeals to different types of coffee drinkers. “Seaport Coffee is the coffee that got us where we are, and with the addition of Texas Coffee, we are focused on the future,” says company President Carlo Busceme III. While each brand is 100 percent Arabica pure coffee, Seaport and Texas Coffee are made from a blend of quality beans imported from coffee growing countries around the world. Seaport is available in five different roasts: dark roast, between dark and medium roast, medium roast, Founder’s Choice and decaffeinated. Seaport's Dark Roast is the heartiest roast in our line, offering the most complex, full-bodied aroma and classic taste on the market today. A favorite among traditional coffee-drinkers in the south! Between Roast combines rich flavor we're known for with a sweeter, lighter flair that is desired by many coffee drinkers. Medium Roast gives you a milder flavor without sacrificing the quality and taste that is synonymous with the heritage and tradition of Seaport Coffee. Founder’s Choice offers a single roast coffee that is superior to the flavor of any of the recognized national brands. This mild roast provides a smooth, yet robust flavor that has quickly gained popularity among all types of coffee-drinkers. This roast has often been described by our customers as the best in our Seaport product line in terms of overall "scents and senses." This describes the alluring scent from a freshly opened bag of Founder's that awakens the senses, and the excellent, distinguished taste of purity within each cup. The distinctive, inviting aroma lets you know you're in for a great cup of coffee. Founder's Choice is the roast that you're sure to enjoy not just with breakfast, but especially after meals. Texas Coffee is a premium roast coffee of 100% Arabica beans offering the richest, most robust aroma and flavor, even for the most discriminating coffee drinker. The deep, heady scents introduce you to a dazzling, almost creamy taste that turns simply drinking coffee into a luxury. Texas Coffee does not have the bitterness or aftertaste 'bite' that you'll often find in other select name brand coffees. Texas Coffee pours onto your palate for a deep, dark taste that allows you to melt into the experience. A true taste of Texas. Ask for this one by name as this may be our most select roast yet, and it's a favorite among holiday gifts. Production begins shortly after the beans arrive in the warehouse as they are sifted, separated and thoroughly cleaned to remove foreign matter. They are then custom roasted to perfection, using different temperatures and lengths of exposure to produce the various roasts. After roasting, the beans are cooled, ground and vacuum-packed for the freshest taste. In fact, many people who became accustomed to the rich taste and then moved away, write that they can’t find the same quality and freshness in any other coffee and ask to be shipped their favorite blend. Texas Coffee Company currently ships to all 50 states. In recent years, some customers have confused other coffee brands as having been locally roasted and packaged in the Golden Triangle. The fact is, only Seaport and Texas coffees are roasted, ground and packaged locally. Other misconceptions involve people believing that Seaport contains additives or chicory. Not true! Seaport is guaranteed to be 100 percent pure coffee with NO additives, fillers or chicory. The pure, true roasting philosophy still holds solid today. The Arabica beans we choose produce such a strong excellence and contain such an earthy & classic element, there's no artificial flavoring necessary. For years, several other competing brands have actually boasted their use of chicory & such - until 2007 when pure beans became a customer demand. So, while other names are changing formulas and following trends, The Texas Coffee Company proudly builds on tradition with high-quality at a whopping 100% - true to taste, true to Texas. 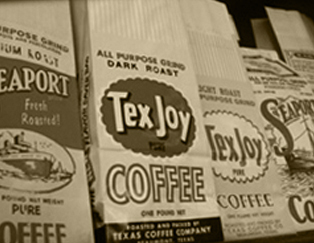 Seaport’s parent company, Texas Coffee Company, also manufactures a line of spices under the TexJoy label. Like the coffee, people throughout the United States and the world request the spices, which are shipped wholesale to a very loyal clientele. Recently, the packaging of all spice products has become fully automated with the addition of new packaging and sealing machines. This equipment allows for the inclusion of a freshness/tamper resistant seal. “We feel that this important improvement will make it easier for us to expand into new markets,” says Busceme. The most popular blend of spice is TexJoy Steak Seasoning. Other special blends include Special BBQ Seasoning, Old West Mesquite Shake, Lemon Pepper, Cajun Seasoning, Italian Seasoning and Old Fashioned Sausage Seasoning. TexJoy and Seaport products are currently stocked in stores from Houston to Lafayette and Galveston to Alexandria, Louisiana. In recent years, our products have begun to make their way into grocery and retail stores as far west as the San Antonio area, as far north as the Dallas area, and east into Mississippi. TexJoy products are now available in ALL Academy Sports & Outdoors stores across the south, including the east coast of Florida and South Carolina. Additionally, the coffee and spices are served by many well-known food service institutions, restaurants, delis, meat markets and bakeries across the country. Even champion chefs and barbeque cooks have carried TexJoy with them from winner's podiums to champion stages, too. In 1999, key leadership management positions were taken over by third-generation family members. Carlo J. Busceme, III became President along with his first cousins, Joseph F. Fertitta, Jr. as Vice-President-Secretary-Treasurer and Donald P. Fertitta as Vice-President-General Manager. The pride and rich heritage of tradition continues on as this new generation carries Texas Coffee Company into the 21st century. With a fresh attitude and renewed commitment to success, there is a new vision for the next century. In 2006, the release of two new products quickly gained popularity among loyal Seaport and TexJoy customers: TexJoy's Taco Seasoning and TexJoy's Texas Steak Shake. December of 2007 marked the first printed labels of our seasoning that is as heart-healthy as it is tasty: our all new 50% Less Salt Steak Seasoning. In early 2009, unveiled our newest Southern French seasoning blend with the name Herbs du Beaumont . It's light, flavorful & you're sure to love it. It is a hometown Texas take on the popular Herbs du Provence. And in 2010 we added a new look to a special, custom blend that we've perfected over many years: TexJoy's Zesty Bar-B-Q Crab and Seafood Seasoning. This seasoning is now available in select grocery store & is a must for Cajun-style cooking, particularly BBQ Crabs, stuffed crabs, fried crab balls, boiled shrimp and - oh yes - frog legs. It's great for crawfish as well, but our Crawfish Boil is specifically designed for that delicacy! To all our customers, we remain dedicated to this proud heritage of continuing to offer quality products and excellent services.